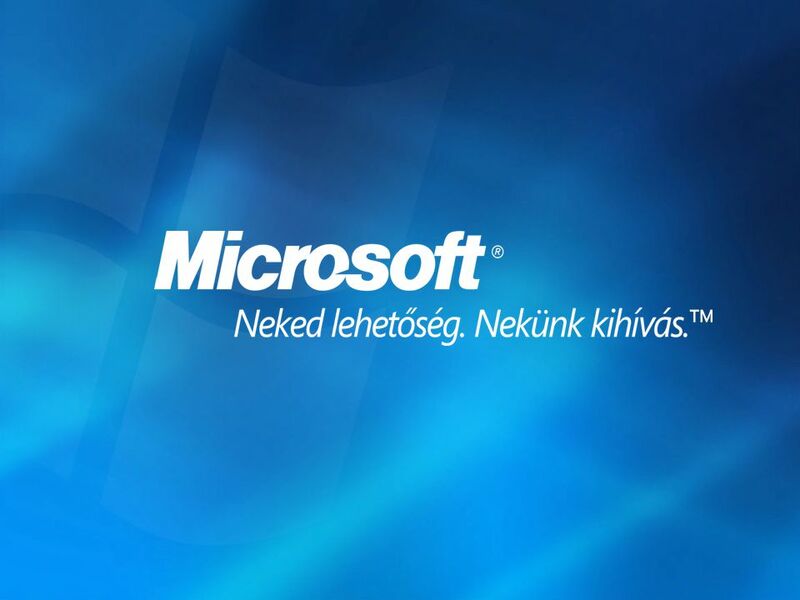 Lepenye Tamás Rendszermérnök Microsoft Magyarország Kft. 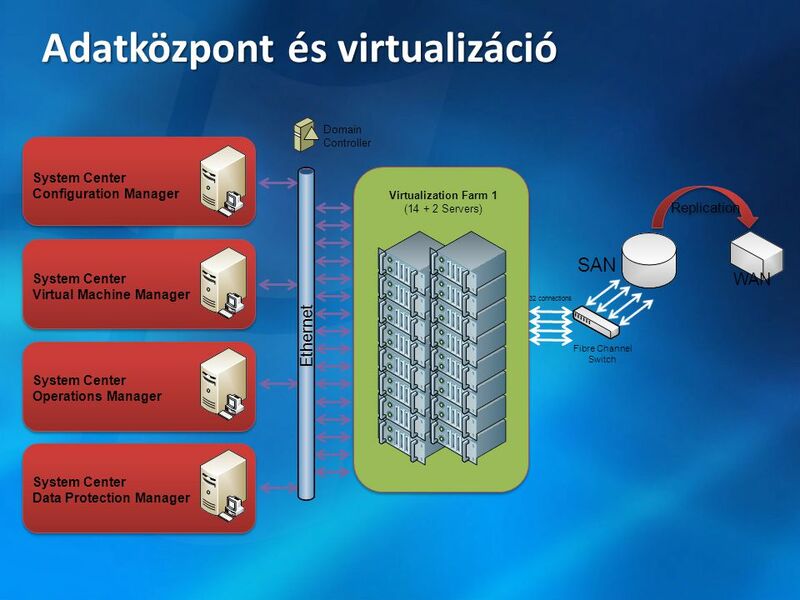 4/3/2017 Adatközpont és virtualizáció Ethernet Domain Controller System Center Configuration Manager Virtualization Farm 1 ( Servers) Replication WAN System Center Virtual Machine Manager SAN 32 connections System Center Operations Manager Fibre Channel Switch System Center Data Protection Manager © 2008 Microsoft Corporation. All rights reserved. Microsoft, Windows, Windows Vista and other product names are or may be registered trademarks and/or trademarks in the U.S. and/or other countries. The information herein is for informational purposes only and represents the current view of Microsoft Corporation as of the date of this presentation. Because Microsoft must respond to changing market conditions, it should not be interpreted to be a commitment on the part of Microsoft, and Microsoft cannot guarantee the accuracy of any information provided after the date of this presentation. MICROSOFT MAKES NO WARRANTIES, EXPRESS, IMPLIED OR STATUTORY, AS TO THE INFORMATION IN THIS PRESENTATION. 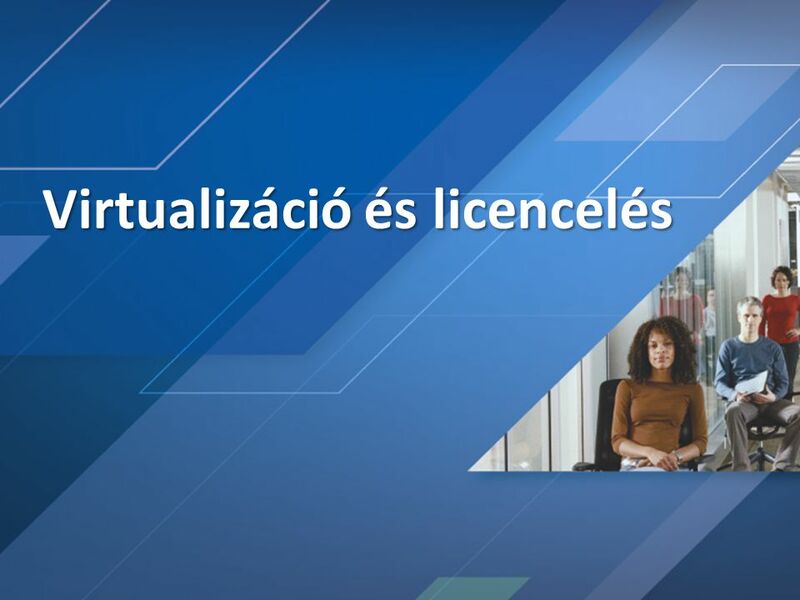 Microsoft Virtualization Deployment Summit 4/3/2017 1:05 PM Server Virtualization Validation Program (SVVP) Probléma: interoperabilitás. A virtuális gép környezet nem ellenőrzött „hardver” környezet. 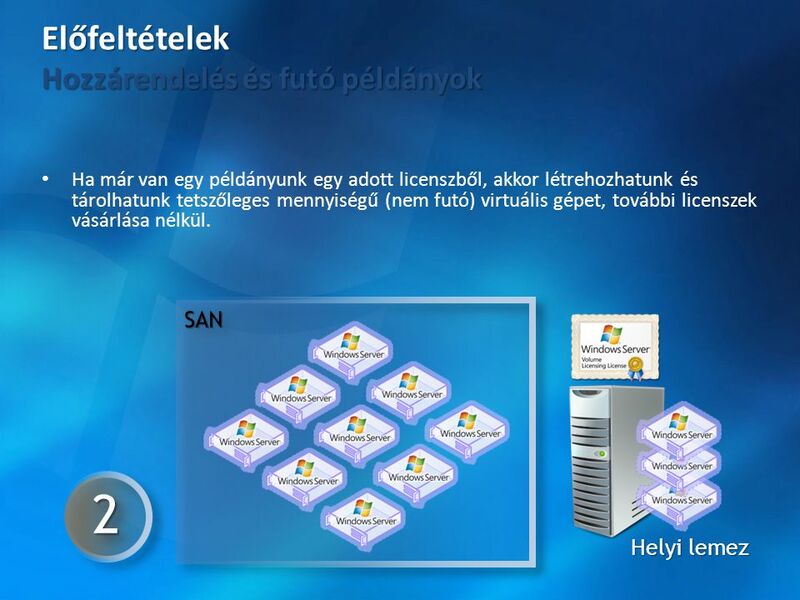 Megoldás: Célok: A legjobb környezet biztosítása a Windows Server 2008 számára A harmadik gyártótól származó hypervisort futtató ügyfelek elégedettségének növelése A Windows kiszolgálók támogatásának javítása Validációs program létrehozása a nem MS hypervisorok számára A legtöbb jelenlegi WHQL követése Egy hivatalos álláspont kibocsátása a gyártók számára, hogy támogatható megoldásuk van Támogatás a TSAnet-tel © 2008 Microsoft Corporation. All rights reserved. Microsoft, Windows, Windows Vista and other product names are or may be registered trademarks and/or trademarks in the U.S. and/or other countries. The information herein is for informational purposes only and represents the current view of Microsoft Corporation as of the date of this presentation. Because Microsoft must respond to changing market conditions, it should not be interpreted to be a commitment on the part of Microsoft, and Microsoft cannot guarantee the accuracy of any information provided after the date of this presentation. MICROSOFT MAKES NO WARRANTIES, EXPRESS, IMPLIED OR STATUTORY, AS TO THE INFORMATION IN THIS PRESENTATION. 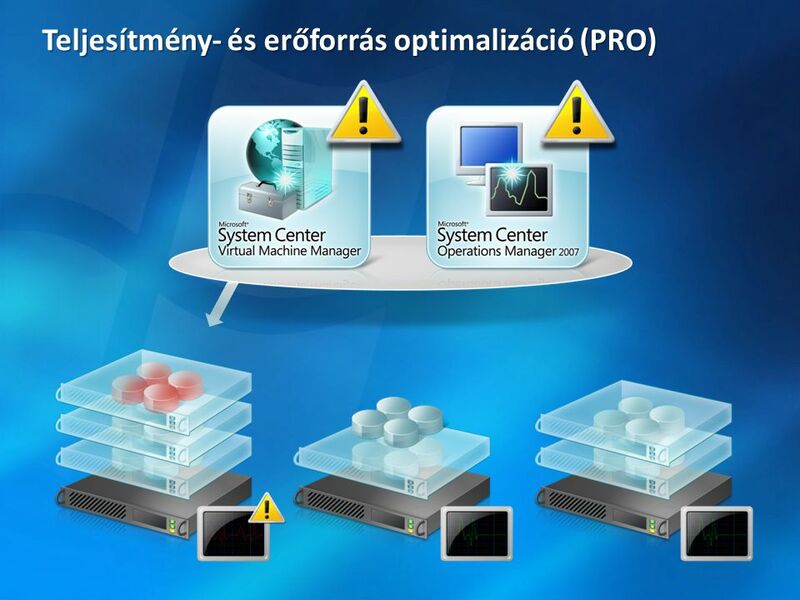 A Windows és a virtualizáció támogatott Windows OS Windows OS Windows Hypervisor Windows OS Validált 3rd Party Hypervisor A Windows és az ellenőrzött hypervisor támogatott a Microsoft és a 3rd party szállító által a TSANet* felhasználásával Nem ellenőrzött hypervisor Microsoft nem támogatja a Windows nem ellenőrzött hypervisor felett** * A Validated hypervisor szállítója tagja lesz a Custom Virtualization group of TSAnet-nek. **Premier támogatás üzletileg ésszerű erőfeszítéssel. 4/3/2017 1:05 PM Gazdagépek (hypervisorok) fürtözése A virtuális gépek mozognak egyik kiszolgálóról a másikra Hyper-V gép Hyper-V gép A hypervisorok fürtözöttek A vendég-gépek nem fürtözöttek Quick Migration Uses host clustering (Only on Enterprise and Datacenter Editions or 2008, now in all 2008R2 ?) Vhds and config files on shared storage (can be iSCSI) Integrated with failover clustering //vm saves state / pauses, vhd moves over, restarts //approx 10 secs for 512MB memory Outage is time it takes to save and restore VM’s memory Scheduled maintence, usually OOH Set up Hyper-V first (on both nodes) Set up shared storage (eg iScsi) Set up Failover Cluster node and disk majority Create VM on the shared storage Vhd and config and saved memory image on shared drive KB allows multiple VHD’s on the same cluster shared drive (but all have to move together as a group) Need to pre-setup the VM guest before making HA same Hyper-V network config on the nodes Active A Hyper-V a Windows Server 2008 Failover Clustering funkcióját használja .VHD-k közös lemezeken (SAN vagy iSCSI) 13 © 2006 Microsoft Corporation. All rights reserved. Microsoft, Windows, Windows Vista and other product names are or may be registered trademarks and/or trademarks in the U.S. and/or other countries. The information herein is for informational purposes only and represents the current view of Microsoft Corporation as of the date of this presentation. Because Microsoft must respond to changing market conditions, it should not be interpreted to be a commitment on the part of Microsoft, and Microsoft cannot guarantee the accuracy of any information provided after the date of this presentation. MICROSOFT MAKES NO WARRANTIES, EXPRESS, IMPLIED OR STATUTORY, AS TO THE INFORMATION IN THIS PRESENTATION. 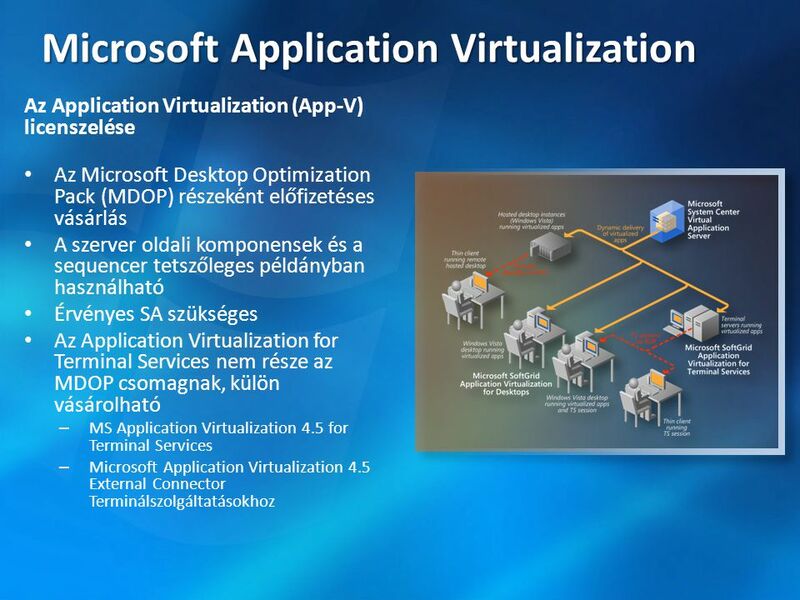 Microsoft Virtualization Deployment Summit 4/3/2017 1:05 PM Egy virtuális gép magas rendelkezésre állásúvá állítása VM erőforrás VM beállítások Lemez erőforrás Erőforrás csoport létrehozása 2. A lemez-erőforrás megtalálása 3. A lemez erőforrás csoportba mozgatása 4. VM konfiguráció erőforrás létrehozása 5. VM erőforrás létrehozása 6. Erőforrás függelmi viszonyok beállítása © 2008 Microsoft Corporation. All rights reserved. Microsoft, Windows, Windows Vista and other product names are or may be registered trademarks and/or trademarks in the U.S. and/or other countries. The information herein is for informational purposes only and represents the current view of Microsoft Corporation as of the date of this presentation. Because Microsoft must respond to changing market conditions, it should not be interpreted to be a commitment on the part of Microsoft, and Microsoft cannot guarantee the accuracy of any information provided after the date of this presentation. MICROSOFT MAKES NO WARRANTIES, EXPRESS, IMPLIED OR STATUTORY, AS TO THE INFORMATION IN THIS PRESENTATION. 23 Használati jogok A használati jogok egyformán vonatkoznak MINDEN virtualizációs technológiára (értsd: más gyártótól származóra is) A hivatalos jogokat a mindenkori legfrissebb Volume Licensing Product Use Rights ( userights/PUR.aspx) vagy az End User Licensing Agreement for licenses tartalmazza A legfontosabb különbség az OEM és a Volume Licensing (VL) licenses között az, hogy a VL licensz hardverhez való hozzzárendelése (legfeljebb 90 naponta) módosítható, míg az OEM licensz minden esetben az eredeti hardverhez rendelt © 2008 Microsoft Corporation. All rights reserved. Microsoft, Windows, Windows Vista and other product names are or may be registered trademarks and/or trademarks in the U.S. and/or other countries. The information herein is for informational purposes only and represents the current view of Microsoft Corporation as of the date of this presentation. Because Microsoft must respond to changing market conditions, it should not be interpreted to be a commitment on the part of Microsoft, and Microsoft cannot guarantee the accuracy of any information provided after the date of this presentation. MICROSOFT MAKES NO WARRANTIES, EXPRESS, IMPLIED OR STATUTORY, AS TO THE INFORMATION IN THIS PRESENTATION. Mielőtt egy szoftver licenszhez tartozó példányt futtatnánk, hozzá kell rendelnünk egy fizikai kiszolgálóhoz Ugyanahhoz a fizikai kiszolgálóhoz több más licensz is hozzárendelhető, de egy licensz legfeljebb csak egy kiszolgálóhoz tartozhat A hozzárendelés után jogosultak vagyunk a licensz alapján a megadott mennyiségű példány futtatására Az OEM licenszt a vásárlás előtt a fizikai kiszolgálóhoz rendelték Assign 1 © 2008 Microsoft Corporation. All rights reserved. Microsoft, Windows, Windows Vista and other product names are or may be registered trademarks and/or trademarks in the U.S. and/or other countries. The information herein is for informational purposes only and represents the current view of Microsoft Corporation as of the date of this presentation. Because Microsoft must respond to changing market conditions, it should not be interpreted to be a commitment on the part of Microsoft, and Microsoft cannot guarantee the accuracy of any information provided after the date of this presentation. MICROSOFT MAKES NO WARRANTIES, EXPRESS, IMPLIED OR STATUTORY, AS TO THE INFORMATION IN THIS PRESENTATION. Ha már van egy példányunk egy adott licenszből, akkor létrehozhatunk és tárolhatunk tetszőleges mennyiségű (nem futó) virtuális gépet, további licenszek vásárlása nélkül. SAN 2 Helyi lemez © 2008 Microsoft Corporation. All rights reserved. Microsoft, Windows, Windows Vista and other product names are or may be registered trademarks and/or trademarks in the U.S. and/or other countries. The information herein is for informational purposes only and represents the current view of Microsoft Corporation as of the date of this presentation. Because Microsoft must respond to changing market conditions, it should not be interpreted to be a commitment on the part of Microsoft, and Microsoft cannot guarantee the accuracy of any information provided after the date of this presentation. MICROSOFT MAKES NO WARRANTIES, EXPRESS, IMPLIED OR STATUTORY, AS TO THE INFORMATION IN THIS PRESENTATION. Bármelyik VM futtatható bármelyik kiszolgálón a kiszolgálóhoz rendelt licenszben meghatározott példány erejéig SAN 3 Helyi lemez © 2008 Microsoft Corporation. All rights reserved. Microsoft, Windows, Windows Vista and other product names are or may be registered trademarks and/or trademarks in the U.S. and/or other countries. The information herein is for informational purposes only and represents the current view of Microsoft Corporation as of the date of this presentation. Because Microsoft must respond to changing market conditions, it should not be interpreted to be a commitment on the part of Microsoft, and Microsoft cannot guarantee the accuracy of any information provided after the date of this presentation. MICROSOFT MAKES NO WARRANTIES, EXPRESS, IMPLIED OR STATUTORY, AS TO THE INFORMATION IN THIS PRESENTATION. Physical Instances:	1 Virtual Instances:	Korlátlan Physical Instances:	1 Virtual Instances:	4 Physical Instances:	1 Virtual Instances:	1 © 2008 Microsoft Corporation. All rights reserved. Microsoft, Windows, Windows Vista and other product names are or may be registered trademarks and/or trademarks in the U.S. and/or other countries. The information herein is for informational purposes only and represents the current view of Microsoft Corporation as of the date of this presentation. Because Microsoft must respond to changing market conditions, it should not be interpreted to be a commitment on the part of Microsoft, and Microsoft cannot guarantee the accuracy of any information provided after the date of this presentation. MICROSOFT MAKES NO WARRANTIES, EXPRESS, IMPLIED OR STATUTORY, AS TO THE INFORMATION IN THIS PRESENTATION. 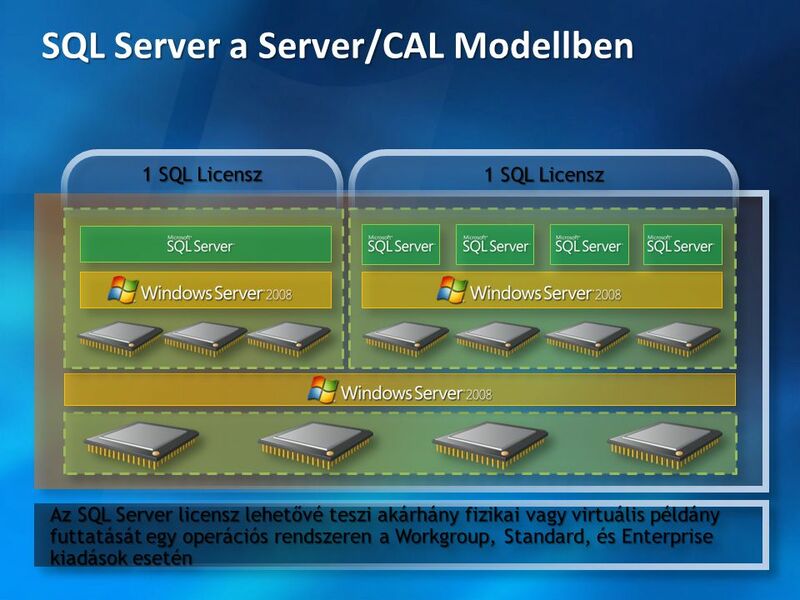 Standard: “Server + CALs” Enterprise: “Server + CALs” Datacenter és az Itanium alapú rendszerek: “Processor + CALs” CALs (Client Access Licenses) A kiszolgálók szerverhez való kapcsolódásához szükséges Verziófüggő (pl. : Windows Server 2003, Windows Server 2008) Windows Server CALs cover all editions Enterprise Agreement vagy más MVLS konstruktcióban vásárolható © 2008 Microsoft Corporation. All rights reserved. Microsoft, Windows, Windows Vista and other product names are or may be registered trademarks and/or trademarks in the U.S. and/or other countries. The information herein is for informational purposes only and represents the current view of Microsoft Corporation as of the date of this presentation. Because Microsoft must respond to changing market conditions, it should not be interpreted to be a commitment on the part of Microsoft, and Microsoft cannot guarantee the accuracy of any information provided after the date of this presentation. MICROSOFT MAKES NO WARRANTIES, EXPRESS, IMPLIED OR STATUTORY, AS TO THE INFORMATION IN THIS PRESENTATION. 29 Találós kérdés: Hány EE kell? Megenged egy VM-ben futó példányt Egy második példány futhat a fizikai kiszolgálón (Physical Operating System Environment: POSE) Ez a példány kizárólag a VM felügyeletét szolgálhatja Olyan alkalmazások telepíthetők rá, amelyek a virtuális példány menedzselik Lehetővé teszi egy korábbi verziójú Standard edition futtatását A POSE példány csak felügyelheti a virtuális OSE-t Egy példány Szerver hardver Alkalmazás 1+1 példány Szerver hardver Alkalmazás © 2008 Microsoft Corporation. All rights reserved. Microsoft, Windows, Windows Vista and other product names are or may be registered trademarks and/or trademarks in the U.S. and/or other countries. The information herein is for informational purposes only and represents the current view of Microsoft Corporation as of the date of this presentation. Because Microsoft must respond to changing market conditions, it should not be interpreted to be a commitment on the part of Microsoft, and Microsoft cannot guarantee the accuracy of any information provided after the date of this presentation. MICROSOFT MAKES NO WARRANTIES, EXPRESS, IMPLIED OR STATUTORY, AS TO THE INFORMATION IN THIS PRESENTATION. 4 VM-ben futó példányt engedélyez a licensz Az ötödik példány lehet a fizikai gép (POSE) Az első négy példánynak virtuális OSE-nek kell lennie A POSE példány csak a virtuális gépek felügyeletére használható Olyan alkalmazások futtathatók rajta, amelyek a virtuális OSE felügyeletét látják el Lehetővé teszi a Windows Server 2008 Standard vagy a Standard vagy Enterprise kiadás korább változatának futtatását bármely OSE-ben A POSE példány csak felügyelheti a virtuális OSE-ket 1+2 példány Szerver hardver Alk 1+4 példány Szerver Hardver Alk © 2008 Microsoft Corporation. All rights reserved. Microsoft, Windows, Windows Vista and other product names are or may be registered trademarks and/or trademarks in the U.S. and/or other countries. The information herein is for informational purposes only and represents the current view of Microsoft Corporation as of the date of this presentation. Because Microsoft must respond to changing market conditions, it should not be interpreted to be a commitment on the part of Microsoft, and Microsoft cannot guarantee the accuracy of any information provided after the date of this presentation. MICROSOFT MAKES NO WARRANTIES, EXPRESS, IMPLIED OR STATUTORY, AS TO THE INFORMATION IN THIS PRESENTATION. 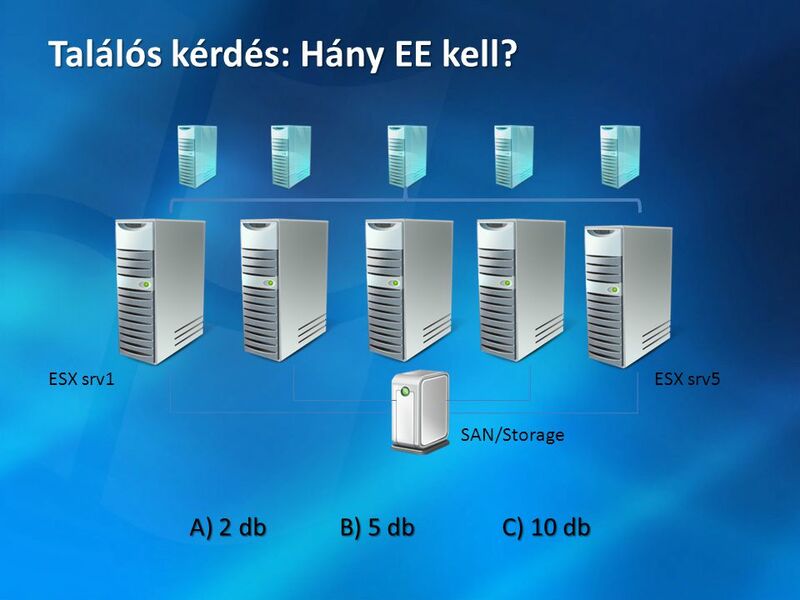 Korlátlan példány futtatásának jogát tartalmazza Windows Server 2008 Standard, Enterprise, és/vagy Datacenter kiadás is futtatható a VM-ekben Nincs megkötés a POSE-ben futó alkalmazásokra Elérhet Volume Licensing keretében 2 vagy több processzoros kiszolgálókra Minden processzorra meg kell venni “Per Processor” + CAL licenszelési modellt követ Megjegyzés: Sohasem a processzor magok után kell fizetni! Korábbi verziók futtatása is megengedett (Downgrade jog) Szerver Hardver Alk. © 2008 Microsoft Corporation. All rights reserved. Microsoft, Windows, Windows Vista and other product names are or may be registered trademarks and/or trademarks in the U.S. and/or other countries. The information herein is for informational purposes only and represents the current view of Microsoft Corporation as of the date of this presentation. Because Microsoft must respond to changing market conditions, it should not be interpreted to be a commitment on the part of Microsoft, and Microsoft cannot guarantee the accuracy of any information provided after the date of this presentation. MICROSOFT MAKES NO WARRANTIES, EXPRESS, IMPLIED OR STATUTORY, AS TO THE INFORMATION IN THIS PRESENTATION. Aktív SA esetén magabb kiadásra lehet „frissíteni” – Step-up áron. 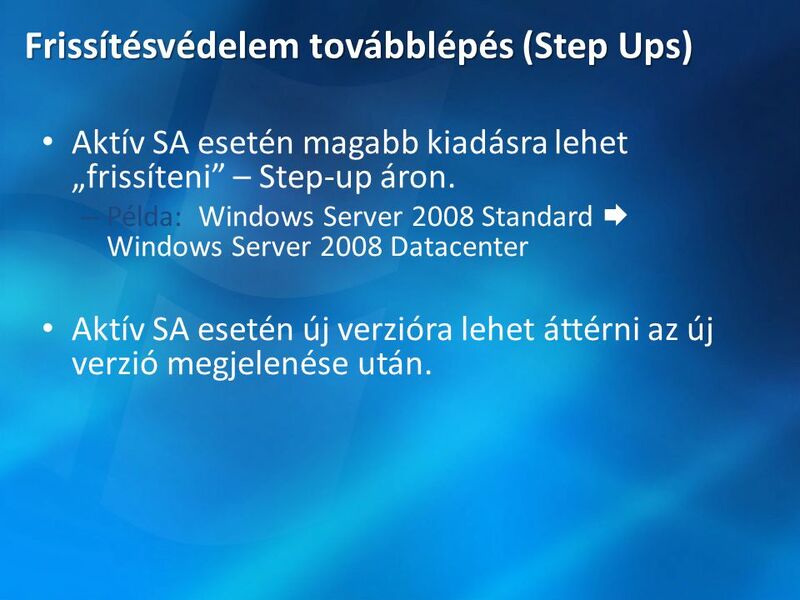 Példa: Windows Server 2008 Standard  Windows Server 2008 Datacenter Aktív SA esetén új verzióra lehet áttérni az új verzió megjelenése után. © 2008 Microsoft Corporation. All rights reserved. Microsoft, Windows, Windows Vista and other product names are or may be registered trademarks and/or trademarks in the U.S. and/or other countries. The information herein is for informational purposes only and represents the current view of Microsoft Corporation as of the date of this presentation. Because Microsoft must respond to changing market conditions, it should not be interpreted to be a commitment on the part of Microsoft, and Microsoft cannot guarantee the accuracy of any information provided after the date of this presentation. MICROSOFT MAKES NO WARRANTIES, EXPRESS, IMPLIED OR STATUTORY, AS TO THE INFORMATION IN THIS PRESENTATION. 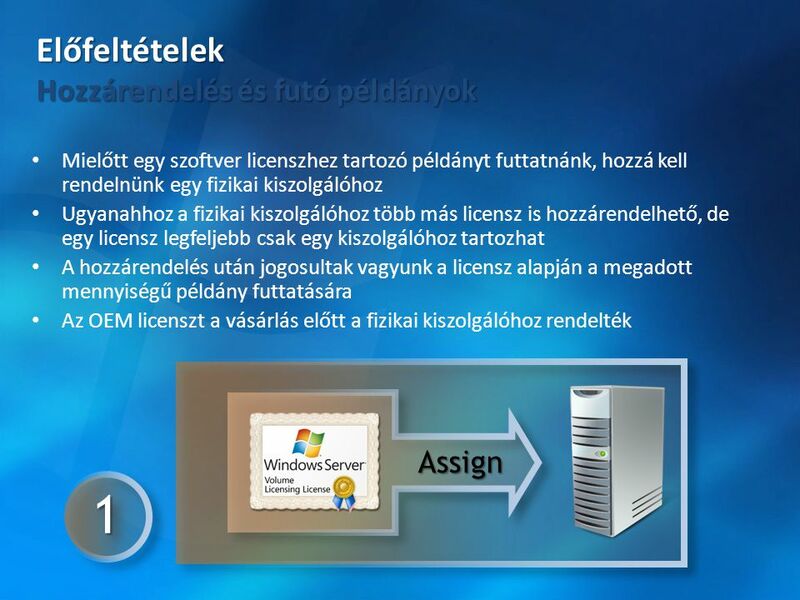 Licensed as Specialty Server Nem szükséges CAL hozzá A virtuális OSE továbbra is igényel CAL-t Nem szükséges CAL a Hyper-V szerver eléréséhez CAL–ra lehet szükség attól függően, hogy mi fut a VM-ben Virtuális gép Virtuális gép Virtuális gép Virtuális gép Szerver hardver © 2008 Microsoft Corporation. All rights reserved. Microsoft, Windows, Windows Vista and other product names are or may be registered trademarks and/or trademarks in the U.S. and/or other countries. The information herein is for informational purposes only and represents the current view of Microsoft Corporation as of the date of this presentation. Because Microsoft must respond to changing market conditions, it should not be interpreted to be a commitment on the part of Microsoft, and Microsoft cannot guarantee the accuracy of any information provided after the date of this presentation. MICROSOFT MAKES NO WARRANTIES, EXPRESS, IMPLIED OR STATUTORY, AS TO THE INFORMATION IN THIS PRESENTATION. 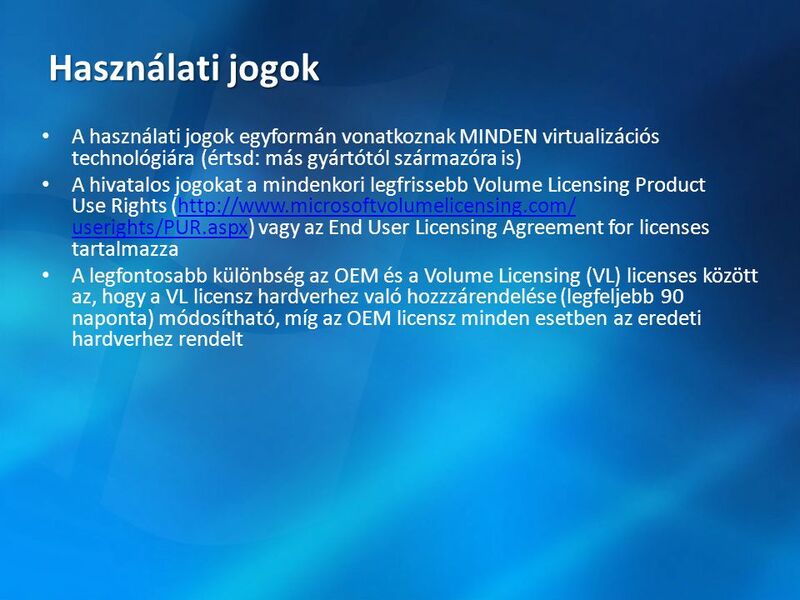 37 Licensz kalkulátor A processzoronkénti VM-ek számától függ, melyik kiadás megvásárlása a legolcsóbb Standard: 1–3 VM esetén Enterprise: 4 VM a kiszolgálón, de nem több, mint 4 VM processzoronként Datacenter: 4-nél több VM processzoronként Windows Server virtualization calculator: © 2008 Microsoft Corporation. All rights reserved. Microsoft, Windows, Windows Vista and other product names are or may be registered trademarks and/or trademarks in the U.S. and/or other countries. The information herein is for informational purposes only and represents the current view of Microsoft Corporation as of the date of this presentation. Because Microsoft must respond to changing market conditions, it should not be interpreted to be a commitment on the part of Microsoft, and Microsoft cannot guarantee the accuracy of any information provided after the date of this presentation. MICROSOFT MAKES NO WARRANTIES, EXPRESS, IMPLIED OR STATUTORY, AS TO THE INFORMATION IN THIS PRESENTATION. Management kiszolgálók (System Center Operations Manager, Configuration Manager, Data Protection Manager, stb.) Egy licensz a menedzsment szerver alkalmazásnak Operations Management License (OML)/Configuration Management License (CML) eszközönként, nem VM-enként! Microsoft Server Management Suite Enterprise Teljes körű licensz megoldás fizikai és virtuális környezetre © 2008 Microsoft Corporation. All rights reserved. Microsoft, Windows, Windows Vista and other product names are or may be registered trademarks and/or trademarks in the U.S. and/or other countries. The information herein is for informational purposes only and represents the current view of Microsoft Corporation as of the date of this presentation. Because Microsoft must respond to changing market conditions, it should not be interpreted to be a commitment on the part of Microsoft, and Microsoft cannot guarantee the accuracy of any information provided after the date of this presentation. MICROSOFT MAKES NO WARRANTIES, EXPRESS, IMPLIED OR STATUTORY, AS TO THE INFORMATION IN THIS PRESENTATION. Egy CAL vagy External Connector egy fizikai eszközre vonatkozik, nem egy VM-re Egy Management License fizikai eszközre vonatkozik, nem VM-re Microsoft Server Management Suite Enterprise System Center Operations Manager 2007, Configuration Manager 2007, and Data Protection Manager 2007, System Center Virtual Machine Manager 2007 Korlátlan számú OSE felügyeleti joga egy fizikai kiszolgálón Alk. Alk. Fizikai kiszolgáló Alk. Fizikai kiszolgáló © 2008 Microsoft Corporation. All rights reserved. Microsoft, Windows, Windows Vista and other product names are or may be registered trademarks and/or trademarks in the U.S. and/or other countries. The information herein is for informational purposes only and represents the current view of Microsoft Corporation as of the date of this presentation. Because Microsoft must respond to changing market conditions, it should not be interpreted to be a commitment on the part of Microsoft, and Microsoft cannot guarantee the accuracy of any information provided after the date of this presentation. MICROSOFT MAKES NO WARRANTIES, EXPRESS, IMPLIED OR STATUTORY, AS TO THE INFORMATION IN THIS PRESENTATION. Mi a VECD? 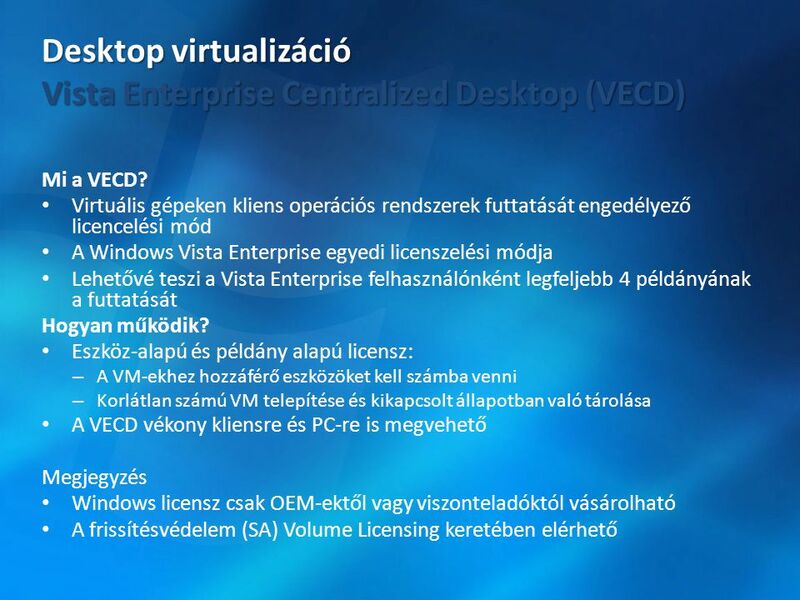 Virtuális gépeken kliens operációs rendszerek futtatását engedélyező licencelési mód A Windows Vista Enterprise egyedi licenszelési módja Lehetővé teszi a Vista Enterprise felhasználónként legfeljebb 4 példányának a futtatását Hogyan működik? Eszköz-alapú és példány alapú licensz: A VM-ekhez hozzáférő eszközöket kell számba venni Korlátlan számú VM telepítése és kikapcsolt állapotban való tárolása A VECD vékony kliensre és PC-re is megvehető Megjegyzés Windows licensz csak OEM-ektől vagy viszonteladóktól vásárolható A frissítésvédelem (SA) Volume Licensing keretében elérhető © 2008 Microsoft Corporation. All rights reserved. Microsoft, Windows, Windows Vista and other product names are or may be registered trademarks and/or trademarks in the U.S. and/or other countries. The information herein is for informational purposes only and represents the current view of Microsoft Corporation as of the date of this presentation. Because Microsoft must respond to changing market conditions, it should not be interpreted to be a commitment on the part of Microsoft, and Microsoft cannot guarantee the accuracy of any information provided after the date of this presentation. MICROSOFT MAKES NO WARRANTIES, EXPRESS, IMPLIED OR STATUTORY, AS TO THE INFORMATION IN THIS PRESENTATION. Többféle modell használatos Szerver/CAL Modell (Exchange, Project) Egy licensz fizikai vagy virtuális példányra Szerver/CAL Modell (SQL only) Egy szerver licensz akármennyi SQL példány futtatását lehetővé teszi egyetlen operációs rendszeren Processzor alapon (SQL, BizTalk) Csak az OS/alkalmazás számára rendelkezésre álló processzor számot kell licenszelni (fizikai vagy virtuális) For Enterprise Editions, licensing all processors allows unlimited virtualized instances © 2008 Microsoft Corporation. All rights reserved. Microsoft, Windows, Windows Vista and other product names are or may be registered trademarks and/or trademarks in the U.S. and/or other countries. The information herein is for informational purposes only and represents the current view of Microsoft Corporation as of the date of this presentation. Because Microsoft must respond to changing market conditions, it should not be interpreted to be a commitment on the part of Microsoft, and Microsoft cannot guarantee the accuracy of any information provided after the date of this presentation. MICROSOFT MAKES NO WARRANTIES, EXPRESS, IMPLIED OR STATUTORY, AS TO THE INFORMATION IN THIS PRESENTATION. A licensz lehetővé teszi egy fizikai vagy virtuális példány futtatását (Korábban az alkalmazások fizikai kiszolgálókhoz kellett rendelni, most már nem kell.) 4 Exchange szerver licensz a 4 VM futtatásához A nem futó példányokhoz nem kell licensz SAN Szerver Hardver Kivétel az SQL … következő dia © 2008 Microsoft Corporation. All rights reserved. Microsoft, Windows, Windows Vista and other product names are or may be registered trademarks and/or trademarks in the U.S. and/or other countries. The information herein is for informational purposes only and represents the current view of Microsoft Corporation as of the date of this presentation. Because Microsoft must respond to changing market conditions, it should not be interpreted to be a commitment on the part of Microsoft, and Microsoft cannot guarantee the accuracy of any information provided after the date of this presentation. MICROSOFT MAKES NO WARRANTIES, EXPRESS, IMPLIED OR STATUTORY, AS TO THE INFORMATION IN THIS PRESENTATION. 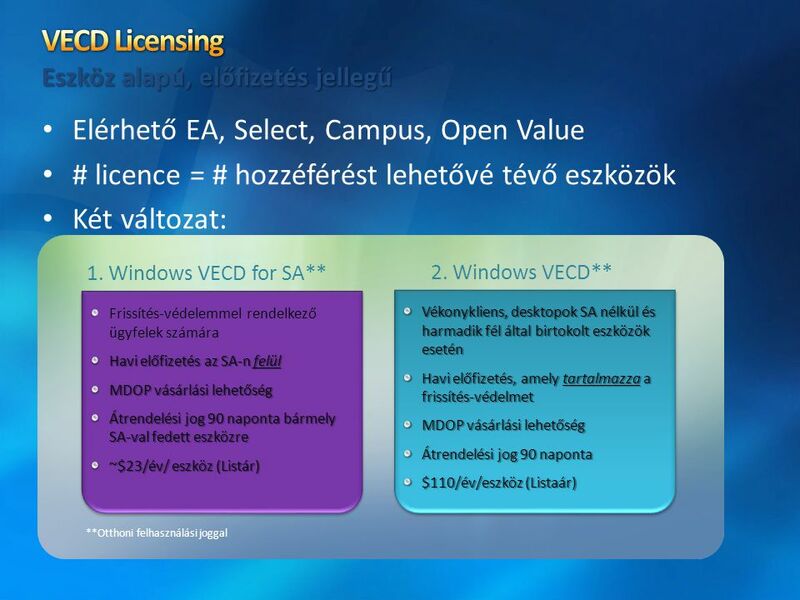 1 SQL Licensz 1 SQL Licensz Az SQL Server licensz lehetővé teszi akárhány fizikai vagy virtuális példány futtatását egy operációs rendszeren a Workgroup, Standard, és Enterprise kiadások esetén © 2008 Microsoft Corporation. All rights reserved. Microsoft, Windows, Windows Vista and other product names are or may be registered trademarks and/or trademarks in the U.S. and/or other countries. The information herein is for informational purposes only and represents the current view of Microsoft Corporation as of the date of this presentation. Because Microsoft must respond to changing market conditions, it should not be interpreted to be a commitment on the part of Microsoft, and Microsoft cannot guarantee the accuracy of any information provided after the date of this presentation. MICROSOFT MAKES NO WARRANTIES, EXPRESS, IMPLIED OR STATUTORY, AS TO THE INFORMATION IN THIS PRESENTATION. 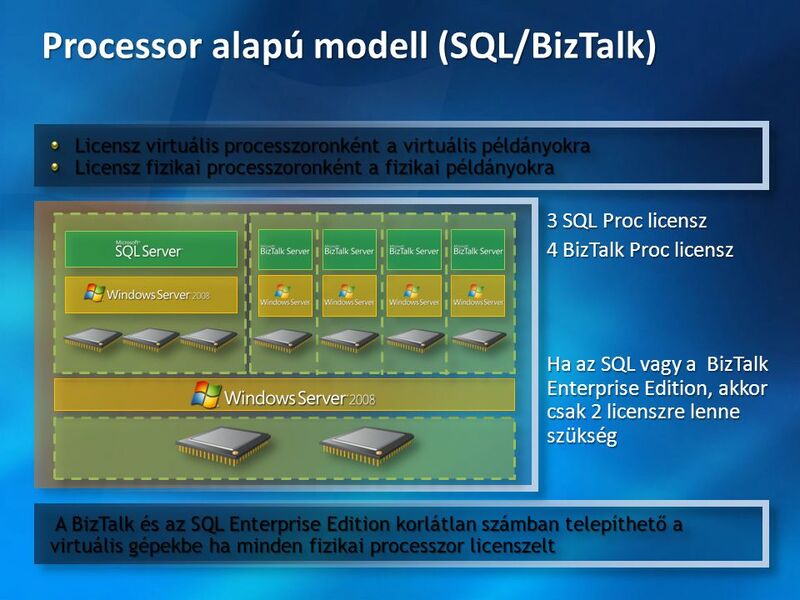 Licensz virtuális processzoronként a virtuális példányokra Licensz fizikai processzoronként a fizikai példányokra 3 SQL Proc licensz 4 BizTalk Proc licensz Ha az SQL vagy a BizTalk Enterprise Edition, akkor csak 2 licenszre lenne szükség A BizTalk és az SQL Enterprise Edition korlátlan számban telepíthető a virtuális gépekbe ha minden fizikai processzor licenszelt © 2008 Microsoft Corporation. All rights reserved. Microsoft, Windows, Windows Vista and other product names are or may be registered trademarks and/or trademarks in the U.S. and/or other countries. The information herein is for informational purposes only and represents the current view of Microsoft Corporation as of the date of this presentation. Because Microsoft must respond to changing market conditions, it should not be interpreted to be a commitment on the part of Microsoft, and Microsoft cannot guarantee the accuracy of any information provided after the date of this presentation. MICROSOFT MAKES NO WARRANTIES, EXPRESS, IMPLIED OR STATUTORY, AS TO THE INFORMATION IN THIS PRESENTATION. 50 További információk Volume Licensing Product Use Rights Windows Server virtualization calculator Licensing Microsoft Server Products with Virtual Machine Technologies Licensing Brief Licensing Microsoft Server Products with Virtual Machine Technologies Whitepaper General Windows Server Licensing information and Licensing Guide © 2008 Microsoft Corporation. All rights reserved. Microsoft, Windows, Windows Vista and other product names are or may be registered trademarks and/or trademarks in the U.S. and/or other countries. The information herein is for informational purposes only and represents the current view of Microsoft Corporation as of the date of this presentation. Because Microsoft must respond to changing market conditions, it should not be interpreted to be a commitment on the part of Microsoft, and Microsoft cannot guarantee the accuracy of any information provided after the date of this presentation. MICROSOFT MAKES NO WARRANTIES, EXPRESS, IMPLIED OR STATUTORY, AS TO THE INFORMATION IN THIS PRESENTATION. 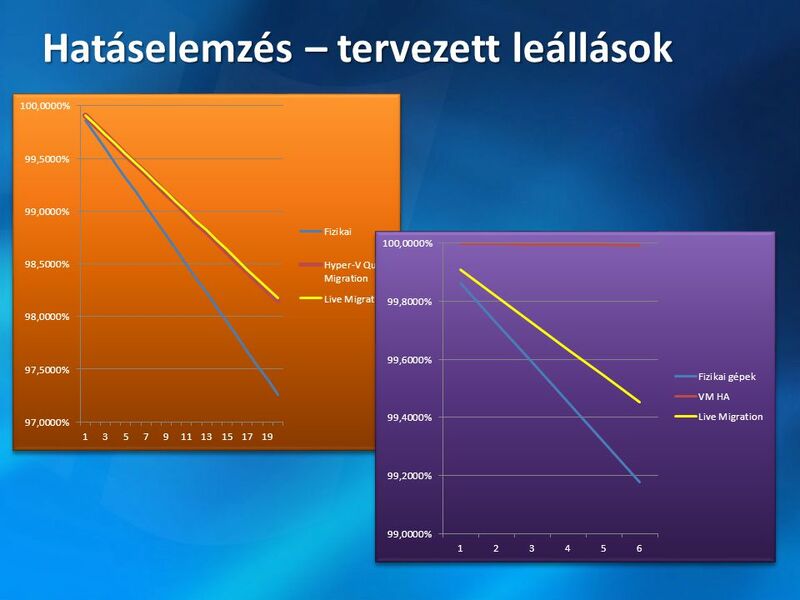 Letölteni ppt "Szervervirtualizációs projektek tervezési kérdései"
Kreitl Péter Gemini-IT Magyarország Kft. 64 bites architektúra, csapdák és átjárók Tóth Sándor Terméktámogatási tanácsadó. Virtualizált Biztonságos BOINC Németh Dénes Deák Szabolcs Szeberényi Imre. GGWA értékesítési program február 14. – április 30. IT-DEV-CON – IT-DEV-CON Kollár László Fejlesztési platform üzletág igazgató - Microsoft. 1 GTS Szerver Virtualizáció – Ügyvitel a felhőben. A Microsoft rendszermenedzsment víziója A Dynamic Systems Initiative A System Definition Model Az üzemeltetésre tervezett szoftverek A SDM jelentősége. Essential Business Server 2008 Szentgyörgyi Tibor NetAcademia oktatóközpont A nagytestvér. 2 Forrás: The Standish Group International, Extreme Chaos, The Standish Group International, Inc., 2000.